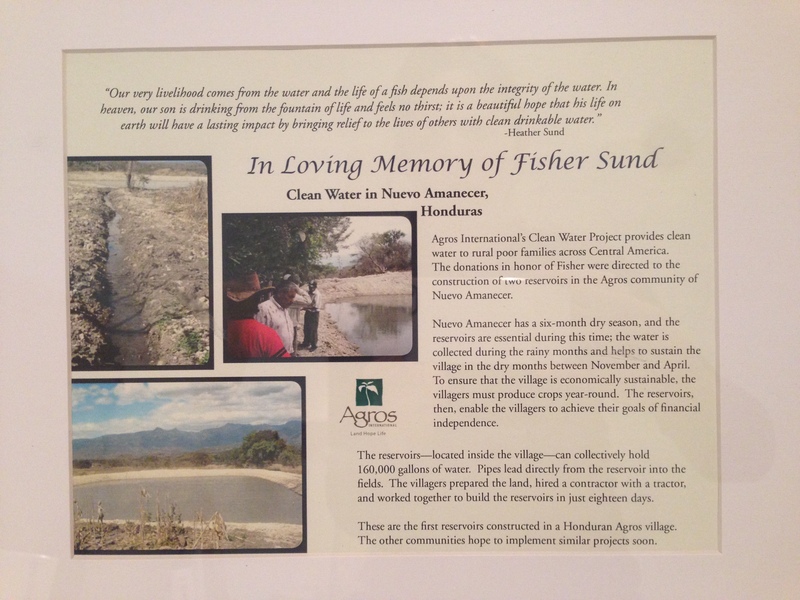 Five years ago, in the days after the loss of our baby boy Fisher, we began our partnership with Agros. While I labored to deliver my full term son who’d lost his heartbeat, I was extremely thirsty. I was unable to drink water because I’d chosen an epidural to numb the physical pain of labor and could only have ice chips. I was profoundly grateful for those ice chips, and for the hope of unlimited water to come. When the reality of his death would be with us, I would have water to drink, to quench me through the unbearable pain of losing my baby. When circumstances are searingly painful, the elements of daily life things that bring comfort are rendered less mundane, seen for what they are, God’s generous undeserved miracles and graces. Undeserved, because as I labored in thirst I thought of what it would be like to be laboring to give birth, to give birth to death even, to be in pain and wanting only a simple drink of water for some relief and have no access to good clean water. My thirst was temporary, and I knew that, and it was the hope of relief that comforted me. Who was I? Who was I to be born into privilege, birthing in the comfort and safety of this nice hospital room, in a comfortable bed, where limitless water would be waiting for me, would quench me, clean me, clean my precious baby’s body in a mere ritual after birth, baptizing the body his soul had already departed. The funeral was being planned. Dear friends guided me through a remembrance ceremony that I could still barely comprehend was happening, and some asked, how can we give? In lieu of flowers, what can we do? Because everyone wants to do something to make something feel better that’s impossible to better. I get that. I wanted that too. Water. I remembered my thirst, my Fisher, how his life was meant to reflect the biblical message of becoming a Fisher of people, how women in other places were birthing without good water, and grieving without good water and I wanted my baby’s life to bring that hope to people. So our dear friend Emily, who works with Agros, made that happen. She set up the process to bring water to a village in Honduras through the generosity of our loved ones. A few months later we became full financial partners with Agros. Alongside a group of wonderful families with young kids who wanted to make a difference in the world, we began supporting the mission of helping people break the cycles of poverty and live a sustainable life, with the vision of not just giving, but of knowing the families we were supporting. Today we leave for our first visit. We go with our two oldest kids and a group of wonderful families and Emily. We get to go and be with the people we have prayed for and loved from afar for all these 5 years. As my son would have been growing into his boyhood, these people have been growing crops and growing hopes and growing out of a life without the basic human comforts that every person deserves. I leave with a lump in my throat, for the babies I leave at home, praying for their safety and ours (please join me in that) and for the baby’s life I will remember again in the faces of people who’s lives have been impacted by a life that was hoped for. There is danger in this country, corruption, crime, hard stories, pain and so much poverty. These stories are in every country, closer to home than we know, but Honduras is a place to hold up in our collective prayers for change. Agros has a vision for those suffering the most, and here we go. All things, slipping through our hands, hoped for. Only by God’s graces do we have these miracles of the lives I do get to have and hold, of the chance to be with people whom God loves as dearly as I love my baby in heaven, of a drink of water. This is His good work, and who are we to be His hands, His womb, His water in a broken beautiful world? God be with us. This entry was posted on Saturday, February 15th, 2014 at 2:52 pm	and tagged with community, death of a baby, Faith, Fisher, friends, gratitude, hope, Longing, Meaning and posted in Hope. You can follow any responses to this entry through the RSS 2.0 feed.